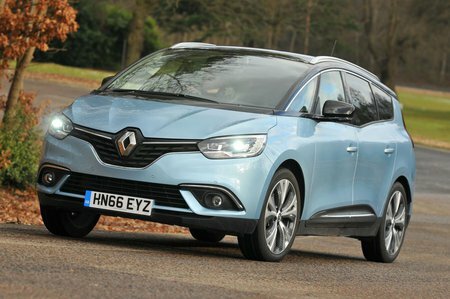 Used Renault Grand Scenic Review - 2016-present | What Car? What's the used Renault Grand Scenic MPV like? Is there such a thing as a stylish MPV? "No," you might say, but the Renault Grand Scenic would beg to differ. Its smooth, swooping curves are a marked departure from the more boxy lines of most of its rivals and, as a result, whether viewed from the front, side or rear it’s a distinctive alternative and – whisper it – maybe even an attractive one. But style counts for very little in this part of the market. Any used MPV must first and foremost be deeply practical; everything else comes second. Unfortunately, that’s where things start to fall down a little for the Grand Scenic. For starters, it isn’t the most spacious of seven-seaters. True, it feels very airy up front, thanks to the huge windows, but further back the high floor means sitting in the middle row of seats gives you a sense of having your knees up around your chin. Sliding these seats forward to give more space to the rearmost row makes things worse; but if you don’t, that third row feels rather claustrophobic – more so than the Volkswagen Touran’s and Citroën Grand C4 Picasso’s. Higher-specification models get a portrait-oriented touchscreen for the infotainment system. It's a sensible idea because it gives you a great view of the way ahead when you’re using the sat-nav. Sadly, the menus for the rest of the system are rather complicated to use and the paucity of shortcut buttons means you’re constantly dipping in and out of menus to change settings. The rest of the dashboard is a mixed bag. For the most part, it looks good, but the effect is spoiled a little by the cheap, shiny-looking plastics lower down. And while the TFT screens in place of traditional dials look smart, they don’t offer the same functionality as proper digital set-ups such as those you’ll find in modern VWs and Audis. Out on the road, meanwhile, the lower-powered 1.2-litre and 1.5-litre engines struggle to lug the Grand Scenic’s heft around, even when it’s empty; if you plan on carrying passengers regularly, you might well want to upgrade to something meatier. The Grand Scenic’s ride will be smooth enough for most, thanks to mallow-soft suspension that damps out most of the big wheels’ thumps and crashes, but the flipside to this is, of course, that it rolls heavily in corners. Allied to numb, remote steering, this leads to a car that won’t give you a great deal of pleasure to drive. The Grand Scenic feels bulky on the road, too, meaning parking can feel like a chore. One thing the Grand Scenic does have in its favour, though, is a good safety record. 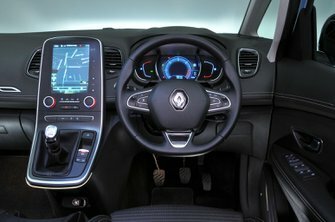 Under the 2016 Euro NCAP test regime, its five-star score is a strong result, bolstered by impressive ratings of 90% and 82% in the adult and child occupant tests respectively.